Ah, the Porsche 911. That most ubiquitous and versatile of all sportscars; loved by many, loathed by a few, and the staple of any self-respecting car event, with an number of examples guaranteed to be in attendance where ever you might be in the world. This year’s Concours of Elegance is no exception, as naturally it will include a 911 in amongst its extraordinary display of cars. However, the Porsche on display at Hampton Court Palace from 6-7 September will be no ordinary, run-of-the-mill 911. Oh no. It will be a truly exceptional example; the ultra-rare 911 RSR 2.14 Turbo that came second overall in the 1974 Le Mans 24 hours race, trailing the victorious V12 Matra. With its ultra-flared wheel arches, huge rear wing and ‘Turbo’ emblazoned over the rear haunches, the ‘blown’ RSR was previewed at the 1973 Frankfurt Motor Show, the model offered an exciting glimpse into the future of the 911 series. Porsche withdrew from factory-backed racing activities for 1974, leaving privateers to represent the marque with the Group 4 RSR. However, in cooperation with sponsor Martini & Rossi, Porsche entered a turbocharged 911 in the Group 5 category for the 1974 Manufacturer’s Championship, to help expand on its technical expertise gained during the final years of the 917 racing programme, and preview the production Porsche 911 Turbo that was being developed for 1975 launch. To comply with the Group 5 regulations that limited capacity to three litres, Porsche developed a 2.14-liter engine with a single KKK turbocharger mounted at the rear in the same manner as its 917 Can-Am cars. The Porsche’s chassis was a vast departure from the production 911 too, with its engineers and implementing the best RSR and 917 components. The RSR’s bodywork made extensive use of fibreglass, with lightweight plastic forming the front wings, rear aprons and all door and deck lids. A substantial rear wing was fashioned to both increase downforce and provide a more discreet inlet for the intercooler. It was painted black to keep a visual relationship with the production 911, and to downplay its huge size. 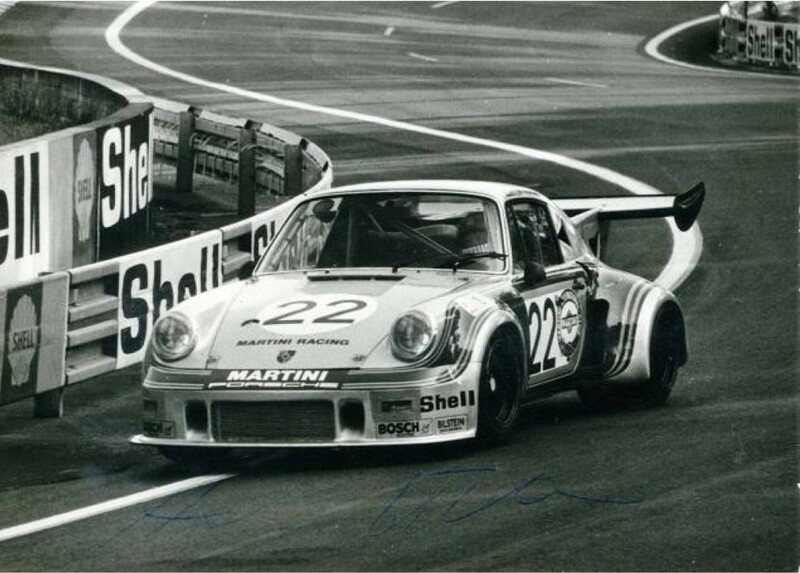 After extensive testing, the RSR 2.14 Turbo 2.14 made its competition debut at the 1974 Monza 1000 Kilometers – finishing fifth overall. It then went on to take an impressive second place overall at Le Mans, finished in the classic Martini & Rossi livery; silver metallic striped in red and blue.